Capcom has already revealed that players will be returning to the extreme conditions of E.D.N. III in the upcoming Lost Planet 3. Players are set to witness the planet during a time when humanity was first beginning to colonize the icy surface. With this single player information in the hands of players it left them wondering what the future of the series’ multiplayer would bring. Now, we finally have the answer. Four compelling multiplayer modes will be available across six distinctly diverse maps, as gamers take control of either the NEVEC forces or the Snow Pirates. The development team is hoping offer players a unique multiplayer experience by offering up something other than the expected free-for-all and team-deathmatch modes. 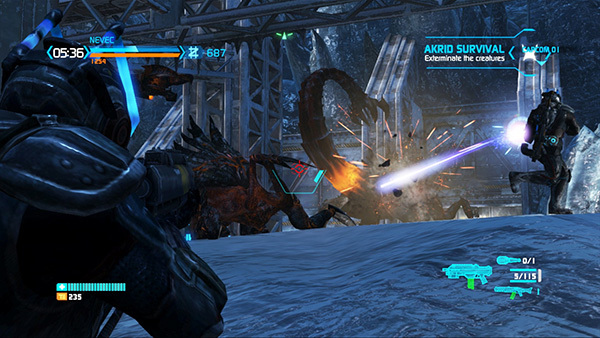 Players will be able to face off in Scenario Mode, and Akrid Survival, for two truly unique experiences to the Lost Planet franchise. Scenario Mode sets each team a series of either offensive or defensive challenges and mixes them up with the extreme and unpredictable conditions of E.D.N. III. Players can compete in both third person on-foot action and in first person combat using the futuristic Vital Suits, making this a dynamic gameplay experience. Akrid Survival sees two teams of three players compete independently of each other in a series of encounters against waves of hostile Akrid before the teams go head to head in a final PvP elimination round. Delivering players these two options for multiplayer mayhem is sure to get fans excited, but there is still more being offered to bring a lasting appeal to the multiplayer experience. Shooting your way through waves of Akrid, and player controlled rivals, will allow you to level up and customize your individual loadouts which can also be upgraded as your progress continues to grow. Still not satisfied? Well luckily, there will also be weaponized mechs to pilot, so there’s that too. Lost Planet 3 is set to release on Xbox 360, PlayStation 3 and PC on August 27th. Be sure to leave us your thoughts on how the multiplayer appears to be shaping up in the comments below.